This may be somewhat shocking, but I’ll just come out with it: last weekend, my friends and I convened for yet another Friendsgiving. This marks the third Friendsgiving I’ve hosted since actual Thanksgiving last year (which, admittedly, was also a Friendsgiving). Have we gone turkey crazy? Not really. This time around the mania was inspired by Corningware. You see, Corningware has this handy dandy new line of colorful products called CW By Corningware, and the company was kind enough to send over some samples (and subsidize the turkey) if I put together a Friendsgiving meal and blogged about it. So here I am: an apartment full of unhealthy leftovers, writing about Friendsgiving again. To change things up, I decided to throw a twist into the typical Friendsgiving affairs. This would be no ordinary meal. This would be a global affair. Yes, every dish would be an international take on a classic American Thanksgiving staple. OooOOOooh. So very Top Chef of us. I’m happy to report that my friends all lived up to the challenge, and the resultant meal was beyond delicious. Pics of the dishes as well as a bonus recipe (!!) after the jump! First international dish of the night: Korean glazed turkey breast! 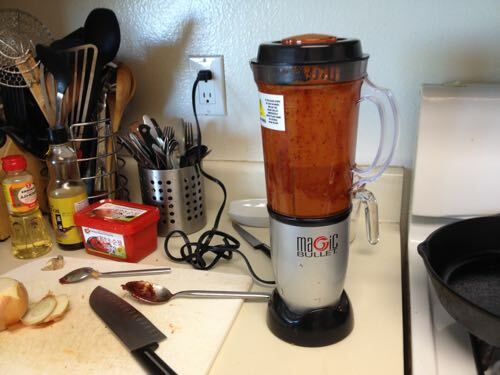 Here’s my Magic Bullet whirring together a bunch of Korean ingredients: ginger, garlic, red pepper paste, red pepper flakes, sesame oil, onion, sesame seeds, soy sauce, and probably two or three other ingredients I can’t remember. 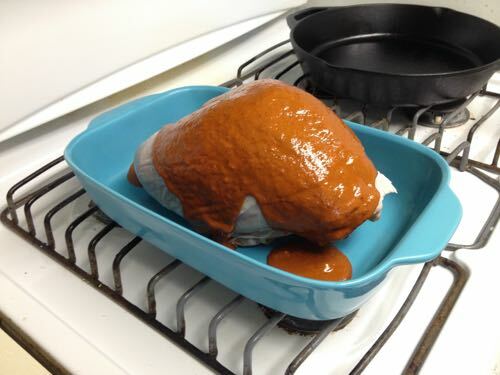 The rub / marinade goes on the turkey breast and sits there for a few hours. At the risk of sounding like a total shill, I’m totally won over by the color of this baking dish. It’s just so eye-catching! Meanwhile, in a bowl I mix together what will be the topping to my Moroccan sweet potato casserole: brown sugar, butter, pecans, almonds, prunes, dates, and raisins. 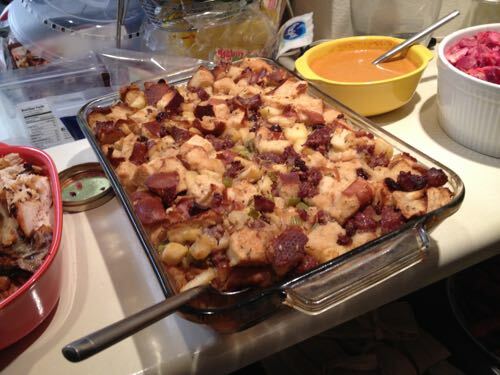 German stuffing made with apples, bratwurst, pretzel bred, mustard seeds, and a heavy dose of beer. On the left is a makeshift sauce for the turkey, made from the leftover marinade and cream and wine (in a CW by Corningware vessel! Ding ding ding!!!). 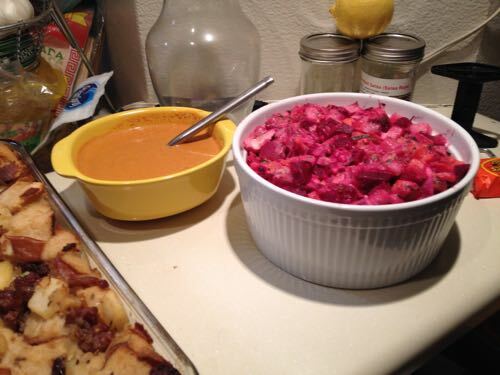 On the right, a beet, carrot and potato salad, courtesy of my friend Sly. It’s the most international dish of the night: orginated in Russia, co-opted by the French, and given to the Vietnamese. Three countries in one! Bam! More importantly, it was delicious. 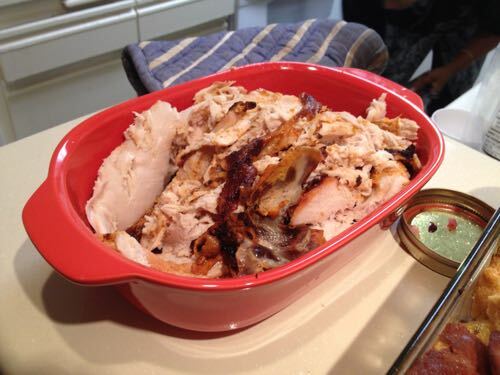 The turkey, all sliced up and ready to go. It was solid — some pieces were dry, some were moist. The Korean flavors also weren’t that strong. It was a decent effort though. Also, CorningWare. Indian mashed potatoes. This was a straight-up Madhur Jaffrey recipe: potatoes with cream, jalapenos, lemon juice, and garam masala. I added a pasilla chile into the mash, just for fun. Very tasty. Not one of the stars of the evening, but a strong performance by a reliable workhorse. Kind of like the Monica Potter of Thanksgiving. My friend Nnanna boldly went where none of us dared to go: tamale land. And to great success! In the center are super tasty Indian roasted carrots from Angie, and then there’s a tall jar of lovely Hawaiian Cranberry relish from Vanessa. Honestly, we were hitting it out of the park. One of the big hits of the night: David’s Thai-inspired red curry mac and cheese. This was a game changer. Spicy, curry-ish, and altogether comforting, everyone could not stop raving about this one. The aforementioned Moroccan sweet potato casserole. No marshmallows (sorry), but instead I used that nutty, fruity topping and added a few Moroccan touches into the potatoes such as date syrup and allspice. Oh, and there was bourbon too. That’s Moroccan, right? And there’s the whole spread. 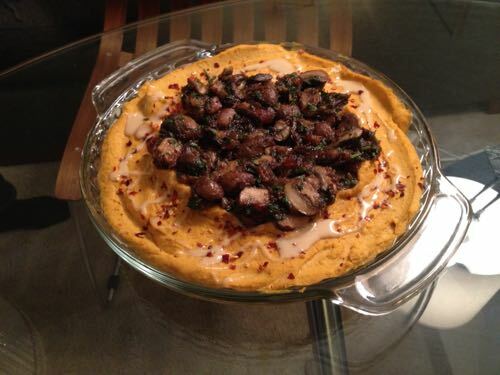 One cannot overlook this utterly beautiful Syrian pumpkin hummus that Sly delivered, replete with mushroom garnish. Def one of my favorite dishes of the night. 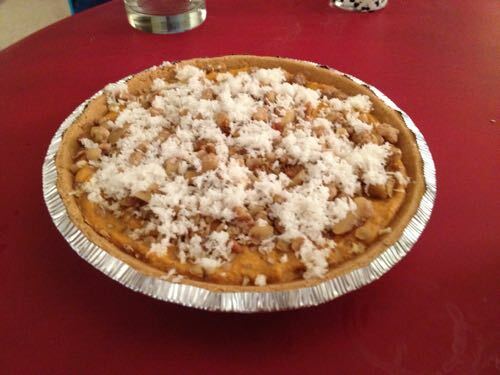 Just when we thought the parade of nations had drawn to a close, Vanessa whipped out her Thai-ish coconut pumpkin pie. This was… amazing. I may never be able to go back to normal pumpkin pie. 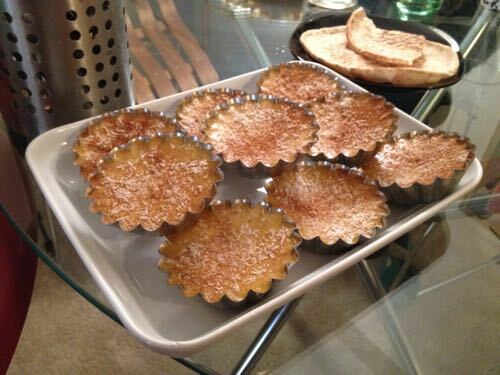 And just for shits and giggles, Vanessa also made some Thai pumpkin custards. Is there anything that woman can’t do? All in all, a killer Friendsgiving. Of the dishes I made (the turkey, stuffing, mashed potatoes, casserole), the sweet potatoes turned out the best; so here is the recipe. It’s modified from a solid bourbon-pecan offering from Chow.com. *approximations. Add as much as you’d like. 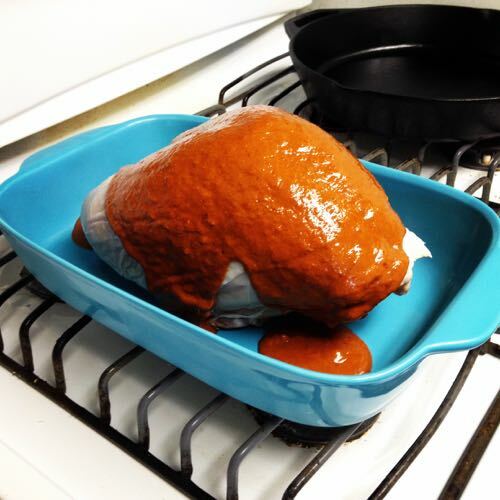 Heat the oven to 375°F and arrange a rack in the middle. Place the yams on a foil-lined baking sheet and roast until very soft to the touch, about 90 minutes. You want them to be not just tender, but caramelized. If some yam oozes out onto the pan, that’s a good thing. You’ll be in good shape when several of the yams feel like they’ve got air pockets in them when you touch them. Sounds weird, but it’ll make sense. Soft and mushy is what we want. Soft and mushy. Pulse the sugar, flour, and salt in food processor until the butter is the size of peas. 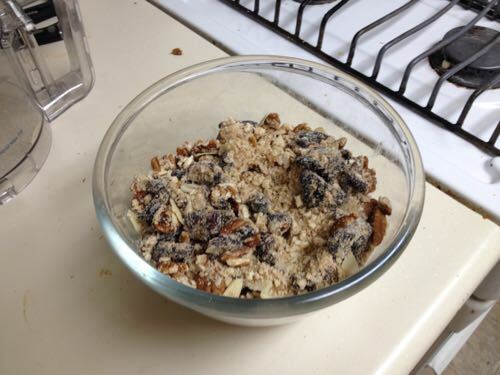 Pour out into a bowl and add all the nuts and dried fruits. Mix it all together well and set aside in the fridge. 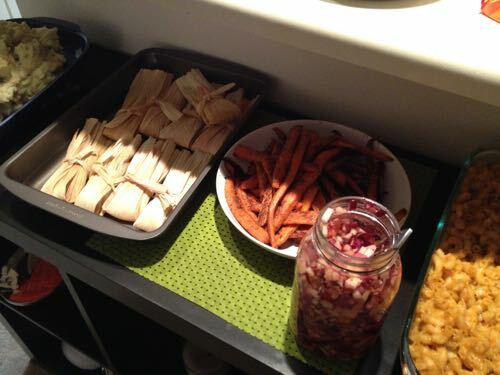 When the yams are done roasting, place the baking sheet on a wire rack and set it aside until the sweet potatoes are cool enough to handle, about 20 minutes. Meanwhile, place the bourbon, measured butter, orange zest, salt, cinnamon, allspice, and nutmeg in a small saucepan over medium heat and cook, stirring occasionally, until the butter has melted and the mixture has started to bubble, about 5 minutes; set aside. Coat a 13-by-9-inch baking dish with butter and set it aside. You can also use kitchen spray if you’re feeling crazy. When the sweet potatoes are cooled, cut them in half lengthwise. Scrape the flesh out with a spoon and transfer it to a large bowl; discard the skins. 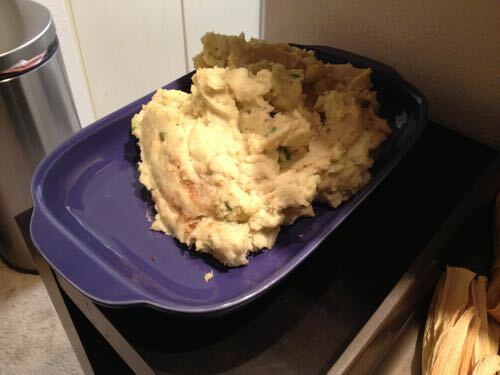 Using a potato masher, mash the flesh until it’s almost smooth but some chunks remain. Add the bourbon mixture and the milk and stir until evenly combined. Now comes the fun part. Add about one tablespoon of date syrup (or maple) to the mixture. Taste and see how you feel. Chances are it’ll need to be a little sweeter. Go ahead and add more syrup. And while you’re at it, add some more cinnamon and allspice. It’s an inexact science that all depends on the quality of the yams and the freshness of your spices. Just keep added syrup and spices (and perhaps milk too) until the yams taste very sweet and very flavorful. This is not a time for subtlety. I like my sweet potato casseroles sweet as hell, and I always go for broke here. 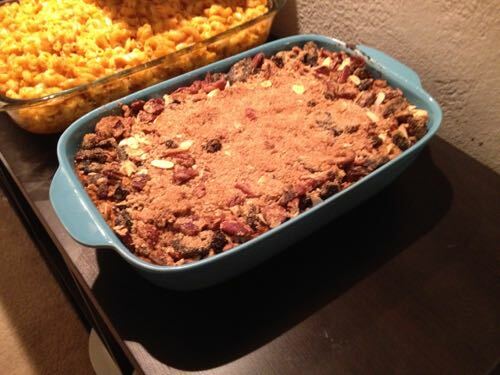 Anyhoo, transfer the mixture to the prepared baking dish and evenly sprinkle the topping over the sweet potatoes. Bake until the top golden brown, about 20-30 minutes. Place the dish on a wire rack and let it sit 10 minutes before serving. This entry was posted in Adventures in Domesticity (Recipes), Food and tagged Adventures in Domesticity, cooking, Thanksgiving by Ben Mandelker. Bookmark the permalink. The CW by Corning Ware make me regret walking by the Corning Store at the Mall Tuesday, Who knew??? 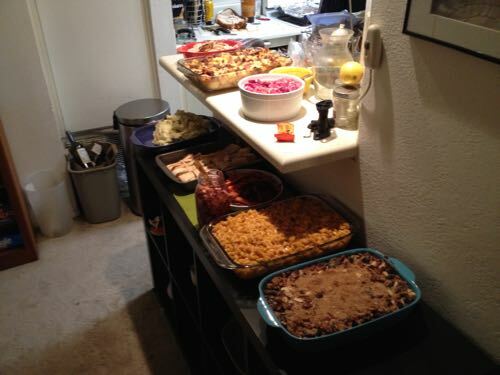 And the Friendsgiving… a fantastic idea. Looks filling. The mac and cheese! Recipe please! 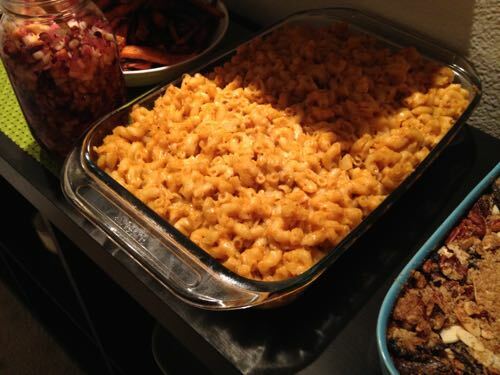 I need that mac and cheese recipe!